Today, Neil Liffen, director of East Coast Physio Ltd (ECP) discusses FOOSH, which is an acronym for ‘fall onto outstretched hand’. FOOSH is commonly documented in patients’ medical notes at this time of year due to trips and or slips, especially slipping on ice. Injury can occur when you fall down and try to break the fall by reaching down with your hand. Commonly, following a FOOSH, commonly injury occurs at the hand and wrist, which may include a fracture and/or sprain injury. However, injury to the elbow and shoulder may also occur, due to the impact of force ascending up the arm to the elbow and shoulder joints. An interesting case this week, involved a 32 year old female client, who was ice skating at a local ice rink and landed heavily onto outstretched arm seven weeks ago. She did not attend A+E and was reviewed by a clinician who advised relative rest and gentle movement. In clinic, seven weeks following injury, the client reported some steady improvement but certain shoulder movements she experienced significant pain and weakness. 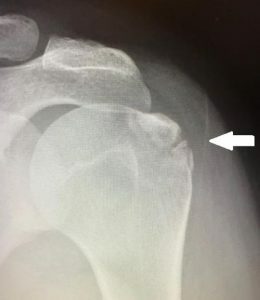 In clinic, I performed a diagnostic ultrasound examination, which appeared to reveal an avulsion fracture of the greater tuberosity of the shoulder (Figure 1) and an x-ray was recommended for correlation. The x-ray confirmed an avulsion fracture (Figure 2). An avulsion fracture is where the tendon/ligaments can pull a fragment of bone away from its attachment site. This patient was then referred to a local orthopaedic consultant for discussion on further management. If the correct management is not performed at the correct time then the patient may be left with life-long functional restrictions. Another important injury at the shoulder not to be missed following trauma and/or FOOSH is a tear of the supraspinatus tendon (Figure 3). The supraspinatus tendon is part of the rotator cuff complex at the shoulder. A significant tear of the supraspinatus tear can cause long-term pain and weakness of the shoulder if not managed appropriately. The morale of the story is to enjoy the festive period, be careful on ice rinks and wintery paths, and if you have a FOOSH and have significant pain and weakness discuss with an experienced clinician regarding early management and possible further investigation to ensure the most favourable outcome. If you need advice, please contact Neil Liffen to discuss. Neil Liffen, currently combines his working week as an Extended Scope Physiotherapist and as a Musculoskeletal Diagnostic Sonographer. He combines working at East Coast Physio, with performing diagnostic ultrasound for several radiology departments based in NHS hospitals. Figure 1. Avulsion fracture as demonstrated on ultrasound. Figure 2. Avulsion fracture as demonstrated on xray. Figure 3. 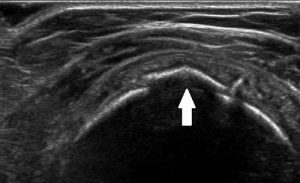 Supraspinatus tendon full thickness tear on ultrasound.